The New Norfolk and Gretna juniors after their match on Sunday. UNDER 13: In a great match on Sunday, New Norfolk 6-122 off 25 overs defeated Gretna 9 for 91 off 25 overs. Coby Kemmler did very well with the bat, making 29 not out while J. Bearman 21 and Josh Cantrell 19 not out also did well. The main wicket taker for Gretna was Sam Jackson who took 2-4 off two overs. In reply Gretna also did well, Tyron Bailey top scoring with a fine 19 not out. Sam Jackson capped off a great day making 10 not out which included hitting his first-ever four. Top job Sam! Jacob Blackwell 9 not out and Tyler Scanlon 9 both did well also. Zayde Hill took 3 for 5 off three overs and Teagan Kemmler 2-19 off two overs were New Norfolk's main wicket takers. 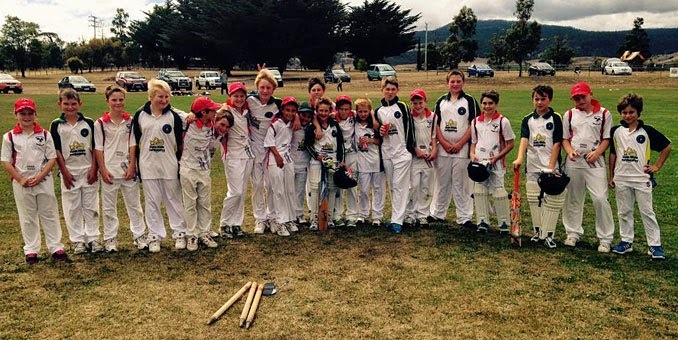 UNDER 15: In a close match at Boyer Oval, Gretna had a one-wicket win. Needing just one run to win with one wicket in hand, Gretna's last batsman Andrew McKenzie hit the winning runs in a real nail biter. Molesworth had first hit, making 10 for 98 off 33.5 overs. J. Bearman top-scored with a well-made 14 while J. Fisher was next best with 13. Jake Campbell 3-12 off 5 and Hannah Mann 3-9 off 4 were the best of the Gretna bowlers. With the bat, Gretna made 9 for 100 off 34 overs. Blake Mayne batted very well making 30 and Jake Campbell made 18. J. Bearman for Molesworth had a great day, bowling extremely well and finishing with 4-26 off 8 overs. J. Lester and J. Nichols both picked up two wickets each. The New Norfolk v Tas Uni match did not eventuate as Uni was unable to field a side. This was a real pity as New Norfolk really was looking forward to playing. These were the last matches for all juniors this season and what a great season it has been. All players should be proud of their efforts.